I’ve been browsing my old blogs in commemoration of the last four years of postings. I’ve decided to share some goodies. 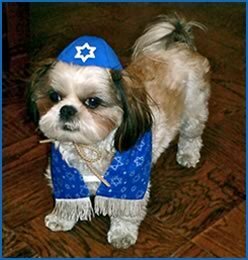 Here’s a Jewish dog joke. Some of you may have heard it before. “It’s a Jewish dog. His name is Irving and he can talk,” says Morty. Morty says, “He has a hearing problem! I said ‘Fetch’, not ‘Kvetch'”. Kurma says: “Can’t figure out this joke? No Jewish friends to ask? Alright, already, read this..